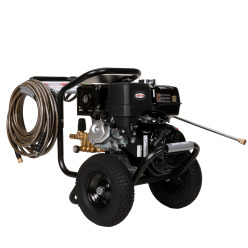 That is why we have Honda Pressure Washers, because of its quality and durability therefore we proud to feature a complete section dedicated entirely to Honda powered pressure washing equipment. No matter what you plan to use your Honda pressure washer for, you can rest assured that it will last a long time and perform exceptionally – even after many years of use under extreme conditions. To ensure your equipment purchases are sound investments, All Pressure Washers highly recommends Honda power washers, all of which are priced to sell. In fact, we are so committed to offering the lowest prices on Honda pressure washers that we will meet any competitors’ prices on Honda power washing equipment that is directly comparable.